If you're looking for a casual yet incredibly chic look, dress in a charcoal long sleeve t-shirt and R13 black skinny jeans. As well as super comfy, these two pieces look wonderful when paired together. Want to go easy on the shoe front? Choose a pair of black leather slip-on sneakers for the day. If you're after a casual yet chic look, consider pairing a tan leopard fur coat with R13 Skinny Fit Jeans from farfetch.com. As well as totally comfy, these two garments look stunning when paired together. Black suede ankle boots complement this getup very well. If you're looking for a casual yet totaly stylish outfit, reach for a black coat and R13 Skinny Fit Jeans. Both items are very comfy and look great when paired together. For shoes, make black leather knee high boots your footwear choice. If you're on the lookout for a casual yet totaly stylish getup, team a navy plaid dress shirt with black skinny jeans. As well as totally comfy, these two items look great when worn together. Consider teaming a dark green camouflage anorak with black skinny jeans for a comfy-casual look. Up the cool of your getup by finishing off with black leather lace-up ankle boots. 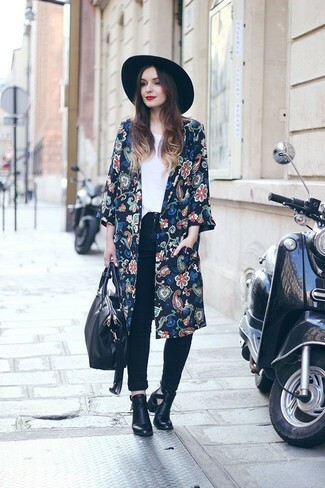 If you're after a casual yet chic outfit, pair a navy floral kimono with black skinny jeans. As well as totally comfy, both of these items look great when worn together. Up the cool of your ensemble by complementing it with black cutout leather ankle boots. If you're scouting for a casual yet seriously chic ensemble, dress in a pink coat and R13 Skinny Fit Jeans from farfetch.com. As well as totally comfy, both items look great when worn together. Grey suede mid-calf boots work amazingly well here. If you're on the lookout for a casual yet totaly stylish getup, team a camel coat with R13 Skinny Fit Jeans from farfetch.com. Both pieces are totally comfortable and they also look great paired together. For something more on the daring side to round off this outfit, rock a pair of white canvas low top sneakers. If you're in search of a casual yet totaly chic look, opt for a beige crew-neck sweater and R13 black skinny jeans. As well as very comfy, both of these pieces look great paired together.